Choose 10 basic facts about your country. Which facts are the most important? Discuss it with your classmates and teacher and decide! Choose 10 interesting places in your region and town. Using a chosen website editor, create a website in English with the information and materials about your country, region and town. You will be working in teams. Each team will present a few points on the website. Be creative, make your website interesting and clear! Try to make it easy to understand by people who have little knowledge about your country! You can attach links to some other websites that could be useful for students from other countries. Your teacher will link your website to this webquest. 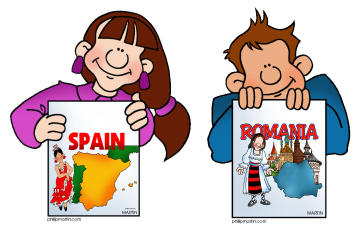 Learn about other countries, regions and towns from the websites created by students from those countries. You will find the websites in the RESOURCES section. Create wall displays in your own language presenting partner countries. You will be working in teams. Each team will make a wall display about one country. Think about interesting ways to present information! Make your wall display eye-catching, and don't overload it with too much text! Propose five questions about the country on your display for the class quiz. Study the displays made by your classmates about other countries and take part in the class quiz. Look at the photos of the wall display about your country made in other schools. Do you like them? Send feedback to the students of other schools. Give them merit points (0-15) for their work.